Just in case you missed my social media posts (or are trying to ignore them - good luck with that! 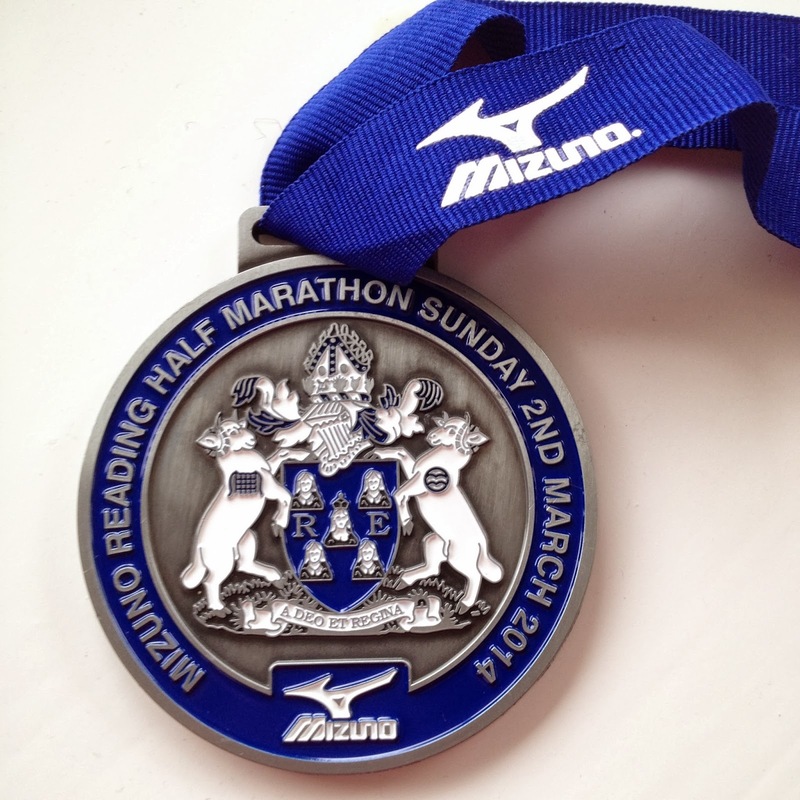 ), yesterday I completed the Mizuno Reading Half Marathon in two hours twelve minutes. It was my first ever competitive run and is the culmination of a fair few months of consistent training and comfort zone avoidance. There's no doubt about it, my medal is beautiful and I earned it. The fact that I completed a 13.1 mile course without stopping or picking up an injury, smiling all the way and high-fiving all the kids with outstretched hands along the route just shows you that if you set your mind to it, something you previously thought beyond you is not. If I can do it, anyone can! Stay warm, don't collapse in a heap and do those stretches! I'm afraid I didn't remember to stretch yesterday, although I had a fair walk back to my car that kept me moving initially - and had brought extra layers to put on post-event (my baggy GAP sweatpants never felt so good). I was really glad for those clothes too, as the wind had picked up during the race and once I'd stopped running it felt pretty cold. 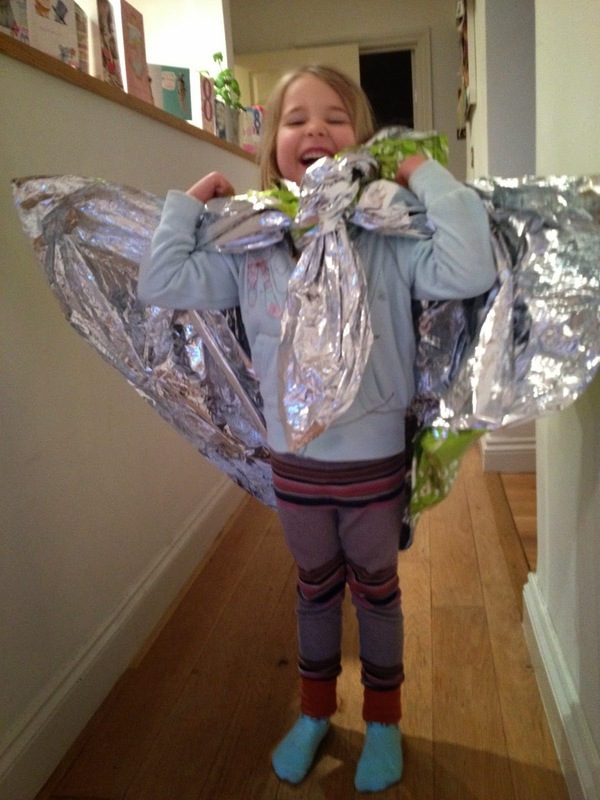 Of course I had my 'crisp packet' blanket wrapped around me too - that my youngest has requisitioned as a super hero cape (I have suggested to her that mummy was a super hero for running, but I don't think she was really listening as she zoomed up and down the hall). You should also look to eat and drink something to rehydrate and replace your body's lost glycogen stores (ideally something that combines carbohydrates, protein and fat) within the hour. Fortunately most runs provide water during the event, and some in your goody bag too. The Reading Half goody bag also had some cereal bars and some Chia Pods - and a Mars bar (I'll let you guess which I plumped for first...). I had prepared though with a carton of orange juice and a Bounce Natural Energy Ball in my bag. I have to admit that I wasn't that hungry or thirsty after the race, partly because the water stations were great during the course (I didn't usually take water when I trained so a few sips along the 13.1 mile route were a great treat - even though I did manage to squirt one water pack all over another runner - sorry!!). Time for a rest, which is actually quite hard if you've been used to working out regularly - or if you are keen to continue your training for a later event. There's a general consensus that it takes about one day to recover for every mile you have raced, but that doesn't rule out gentle runs and cross training in that time. It basically means, don't go nuts in the few days after your event unless you want an injury that could set back your on-going training. This is the time to apply heat, or ice to those muscles (via a bath, a cream, a packet of peas, whatever floats your boat) use Epsom Salts, get on the foam roller or book a massage (yes, yes, please). You should also make sure you get adequate sleep and continue eating well (if you've been training for longer distances, it's a given you will have been doing both these things anyway right? ), as you need to allow your muscles to repair themselves and your immune system can suffer after a race. Unfortunately for me, research suggests women over 40 take longer to recover after a race than their younger counterparts and men in general, because as we age, the rate that muscle fibers are generated slows down. (So if you're female and under 40 start running now!). Training for an event isn't just a physical thing. I used a lot of positive affirmations to convince myself that I am in fact a runner, not just a girl in work out gear out managing a bit of a jog. For many people, there's actually a post-race dip that is the result of physical fatigue, a sudden lack of routine and the contrast in endorphin levels. Could one of these races be your next challenge? As such it's important that you celebrate your race, even if you didn't run a personal best or your mate pipped you at the post, because at the end of the day YOU STILL RAN THE RACE!!!! So bask in your glory, in the next couple of weeks enjoy doing a few things that you have been unable to do during your training (a late night here, a glass of wine there) - and then refocus your goals (see my life-coaching article for tips there). Do you have any tips to add? How did you feel after your event? Has my experience made you feel like running a Half Marathon is something you would want to do - or exactly the opposite?! Please leave a comment below. Huge congratulations on completing the half marathon! Sounds like you are hooked?! Well done and I look forward to hearing what your next goal is. Hello - thank you! The session with Go Run Henley really helped me on the big day day. Not sure about that next goal. I certainly need a few days to recover! Thank you! Knees do seem to be an issue for some people when they run a lot - my weak point is my shoulders so I'll never be a bodybuilder! I even managed to hurt my arm when I was running once... Right now I'm trying to follow my own advice on recovery, which is surprisingly hard!! Thank you for commenting. So awesome! What a rock star you are!! I love the picture of your daughter and your repurposed race blanket! Get Cracking on Easter Craft! Lychee cocktail or bubbles Mum? Put this in his pocket!